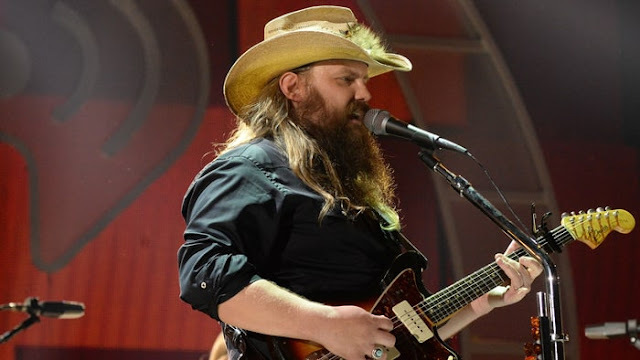 The summit of the Billboard’s Country Airplay chart, for the first time belongs to Chris Stapleton, as the song ‘Broken Halos’ moves up from 2nd place to No. 1. The single released by publishing label Mercury Nashville has now been in the charts for 35 weeks, after the week that concludes on March the 24th. According to Nielsen Music, the song experienced an uplift in audience impressions by 2 percent for a total of 41.2 million in the week ending March 18th. ‘Broken Halos’ also enjoys holdings its No. 5 spot in the Hot Country Songs, which combines streaming, sales and airplay numbers. This is the highest position the song has obtained in the chart and it was held it since the week that ended March 3rd. In the Country Digital Song Sales chart, the song is a t No. 6 as it had 13,000 downloads during the week that ended March 15th. It also had 5.4 million streams in the U.S. as it ranked No. 17 in the Country Streaming Songs chart. The song was written by Stapleton in collaboration with Mike Henderson, and is an organic-styled single from his album ‘From A Room: Volume 1’. The album managed to top the Billboard’s Top Country Albums chart, in only its debut week back in May 2017, while selling 219,000 equivalent album units. Till now, the album has managed a total of 961,000 sales, of which 741,000 have been traditional album sales. It has also managed to top the Top Country Albums and the Americana/Folk Albums for eight and thirteen weeks respectively. Stapleton now has the honor of being the first male to top both the Country Airplay and Americana/Folk Albums, owing to ‘Broken Halos’ and its album. Four other artists and bands have achieved that feat, which include Mary Chapin Carpenter, Alison Krauss, Rosanne Cash and Dolly Parton. The ‘Broken Halos’ artist is no stranger to the Billboard Charts, as ‘Traveller’ which was released in 2015, holds the record for the most weeks spent at No. 1 in the Americana/Folk Albums Chart. It was at the pinnacle for 42 weeks, most recently in the chart ending March 17th, while also enjoying being No. 1 in the Top Country Albums for 29 weeks. Meanwhile, in the Country Airplay, this is Stapleton’s sixth appearance. Before that ‘Either Way’, which was the launch single of his latest album, peaked at No. 26 in its debut week in May 2017. His only other song to get into the top 10 of the Country Airplay was ‘Nobody to Blame’, which was No. 10 in the weekly chart that ended of April 2nd, 2016. The other songs to feature in this chart are ‘Parachute’ that managed No. 17 last year, ‘Tennessee Whiskey’ which got to No. 57 in 2016 and ‘What Are You Listening To’ managing a highest of No. 46 in 2013. The former two songs are from his debut album ‘Traveller’, with the latter being a standalone song. The Hot Country Songs chart is topped by ‘Meant to Be’ by Bebe Rexha and Florida Georgia Line for the 16th week.